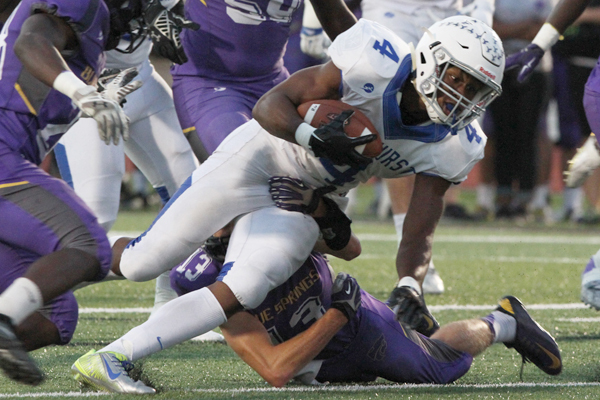 This year’s Rockhurst-Blue Springs game was unlike most between the two programs. Usually two of the top teams in the state, both teams came into Friday night’s game with young teams and were sitting at 1-4 on the season. And despite a close first half - Blue Springs led 14-13 at halftime - by the time the clock wound down in the fourth quarter, one team appears to be heading in the right direction, while the other is still stuck in neutral. Rockhurst dominated both sides of the ball in the final 16 minutes and cruised to a 39-21 victory to improve to 2-4 on the season. Leading the charge was star running back A.J. Taylor and a suffocating Hawklets’ defense. Cameron Reller changed that early in the second half in what was one of the bigger plays of the game. Rockhurst got the ball to start the second half and took the lead on a Jackson Terry field goal, 16-14. On the third Blue Springs play of the following drive, Reller came off the edge and blindsided quarterback Dylan Cowling, knocking the ball free. The Hawklets recovered and had a short field, starting with the ball on the Blue Springs 43-yard line. Seven plays later, Rockhurst quarterback Chance May - filling in for Tyler Benninghoff - found Jack Powell for a 4-yard touchdown pass and a 22-14 lead after the extra point was missed. "Chance May did a great job tonight filling in,” Severino said. Added Reller, "That’s what the plan was at half. Get the ball back to the offense." And they kept that trend going. On the following drive, the Wildcats tried to get some kind of spark lit and went for it on fourth-and-1 from their own 34, only to have Jaylen Ivey get stuffed at the line of scrimmage for no gain. With another short field, the Hawklets took advantage once again, needing just four plays for Taylor to find the end zone from 20 yards out. After another Terry field goal made it 32-14, Taylor put the cherry on top of the win with a 74-yard touchdown run. That wasn’t a problem on this night, as Taylor was a workhorse, carrying the ball more than 30 times for 321 yards and three scores. The Wisconsin commit has taken to his role as the offenses go-to threat in his senior season. The loss puts the Wildcats at 1-5 on the season, as they were unable to build off last week’s exciting overtime win over Lee’s Summit. Things won’t get any easier next week when they travel to Ray-Pec. As for Rockhurst, they will travel to face Columbia Hickman next Friday in hopes of getting consecutive wins for the first time this season. Taylor is confident the team has turned a corner. "Last week we started to raise the bar a bit,” he said. "This week we picked it all the way up. We’re on a new roll."